Iowa Senator Tom Harkin is trying to downplay concerns Iowa’s agri-business interests will be losing some of their clout as Harkin resigns his chairmanship of the powerful Senate Agriculture Committee. The new chair is Senator Blanche Lincoln of Arkansas. Harkin, a Democrat, says Iowa’s ethanol producers in particular shouldn’t worry about the panel’s shift in power. Harkin resigned as Ag Committee chairman on Wednesday as he was named chairman of the “HELP” panel, the Health, Education, Labor and Pensions Committee. Senators are only allowed to chair one panel at a time. Harkin replaces the late Senator Ted Kennedy as chair of the HELP Committee, which is spearheading the Senate’s effort to reform health care. 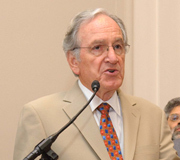 Harkin was appointed to the House Ag Committee when he was first elected to congress in 1974. When he won a Senate seat in 1984, he became a member of the Senate Ag Committee and served as chairman when the panel wrote the 2002 and 2007 Farm Bills.